SERVPRO, professional and dedicated to being fast on site to prevent further damage. When your Plano, KY, commercial property is damaged by water, you may not know where to begin when it comes to cleanup efforts. Depending on the type of water damage your building experiences, recovering and making repairs can be challenging. However, there are a few tips you can keep in mind so you can take action right away when such problems arise. 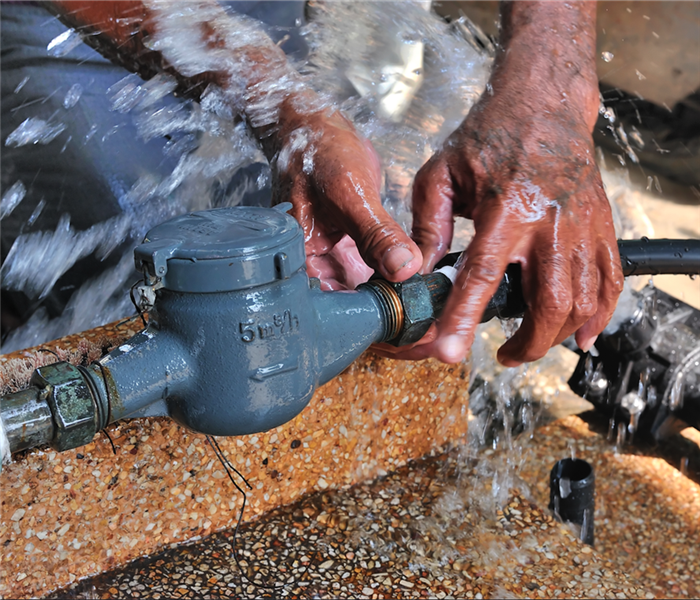 If your problem is stemming from frozen or broken pipes, you may be able to reduce the amount of damage that occurs by turning off the main water line. It is important to remember to take this step only if the shutoff is in an area that is safe, not flooded or does not contain electrical paneling. If you rent the building and do not know where the shutoff valve is, call your landlord as soon as you discover the line break so he or she can come to assist you. Water cleanup may be simpler if you can keep flooding contained. 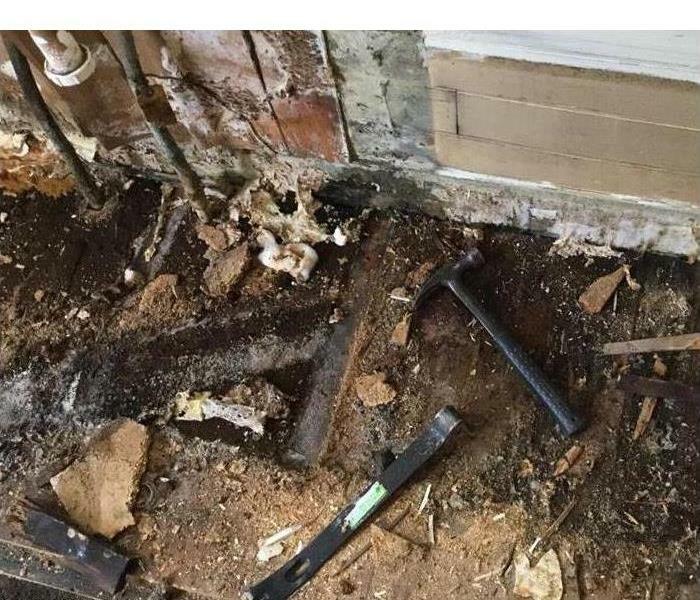 For example, in the case of flooding from a broken sink pipe in the bedroom, You can attempt to seal off the area by closing the door and stuffing the base with towels. Once the area is secure, place caution signs around the area to alert employees to the possible danger and do not allow anyone inside until professionals arrive to drain away the water. Calling your local water damage and cleanup company can be instrumental in the remediation process, especially when it comes to preventing problems that are caused by standing water. A company that specializes in water removal and restoration may help reduce the risk of mold growth and other issues that can be caused by flooding. When water damage threatens your Plano, KY, business, knowing how to reduce the risk of long-term problems can help you lower repair costs and protect your greatest investment. When commercial property owners notice mold growth in their buildings, it is reasonable to panic, but it is not always necessary. However, if you are currently experiencing a mold problem, you likely have a few questions. Therefore, to help ease your mind, the below list is a compilation of the four most common questions about mold. There are variations of mold, and some of them are toxic while others aren't. Most common funguses are not poisonous and will not negatively impact health unless you are exposed to high levels for prolonged periods of time. Therefore, quick remediation is always best. 2. How Fast Does Mold Spread? Mold growth can begin within 24 to 48 hours of water damage, and it will continue to spread rapidly after that if not remediated. Also, mold is not limited to only water damaged areas. Spores can spread throughout your property through ventilation systems, contaminating multiple areas at a time. 3. What Are the Primary Causes of Mold? High humidity and moisture or water damage are the primary causes of mold development. Spores exist everywhere, and there is no way around that, but to grow fungus needs water and moisture. 4. How Does the Remediation Process Work? When hiring a mold remediation specialist in the Smiths, KY, area, keep in mind that it is a five-level process: (1) protection, (2) containment, (3) tear out, (4) cleaning and disinfecting and (5) salvage and restoration. While containment and tear out are the most significant parts of the remediation process due to actual mold removal, each level builds on the next to ensure the safety of your building, tenants and yourself. Mold growth is a real concern for many property owners. However, the fears can be minimized if you take action when you encounter a problem and call in a specialist. The number of mold varieties and the possibility of spread means that calling in professionals may be the only responsible action to take. 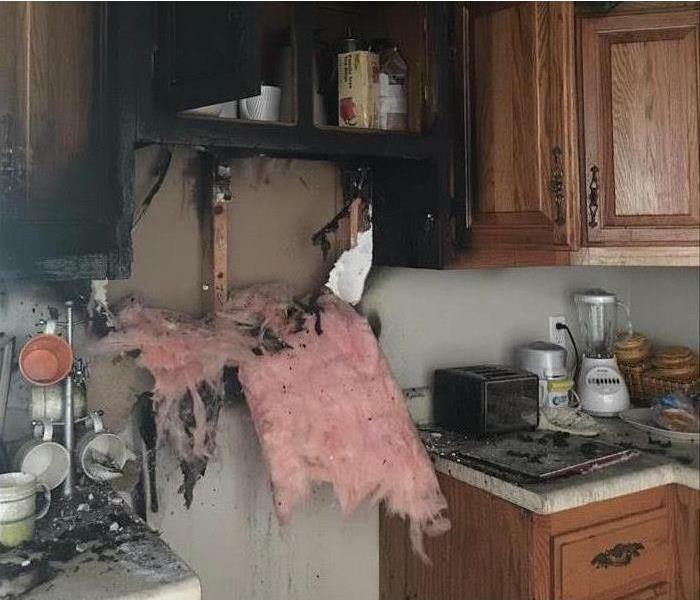 This Bowling Green, KY kitchen was damaged when a pan caught fire and ignited the stove and cabinetry above. Smoke and soot affected most of the home and the resident had to move out until work could be completed. We heard about the fire on Twitter and arrived on the scene while it was still smoldering. It takes several days of scrubbing down walls and ceilings as well as setting negative air machines to help with the odor in the home. SERVPRO of Warren County uses special chemicals in order to cut through the grime caused by a grease fire. Our crew works dilligently to get this work done in order to get the resident back in their own bed where they belong. Our customer was very happy that we were there in a timely manner to get the process started as smoothly as possible. Solar Panels on the roof of a suburban house in Bowling Green, KY. 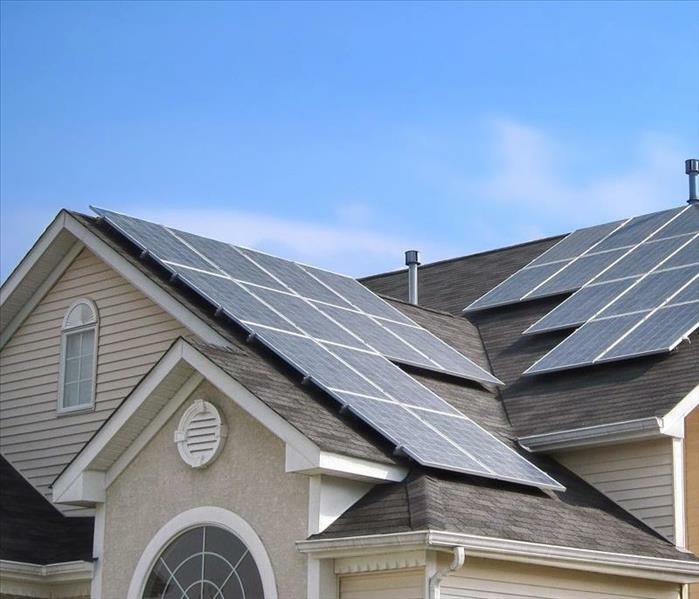 Solar panel damage is rare, but when it does happen, it’s usually as a result of a hard-hitting storm. There are a few things you can do to prepare if you know a storm is on the way to Bowling Green, KY. The examples below of instances where panels stayed intact may give you peace of mind that yours could also stay safe. Solar panels are usually built to hold up even in the most extreme of circumstances. However, there are some common causes to damaged panels. • Hurricane Maria: 180 mph winds didn’t even leave a scratch on a 645 kW solar array on a VA hospital in San Juan. It operated well after the storm, even though nearly all of the island was without power. • Hurricane Sandy: panel damage was few and far between in New Jersey when this hurricane hit in 2012, days after the state installed dozens of panels. • Severe hail in Denver: only one out of more than 3,000 panels on the National Renewable Energy Laboratory campus was damaged in this rare storm. Prepare for a storm the same way you would without solar panels. Don’t try to remove them, as the racks are built to handle the storm. You may want to take pictures of the system just in case. If the storm does cause an issue, you can show those pictures to your insurance agent. Most providers cover panels, but you may want to double check before it’s too late. When you do experience panel damage, don’t try to fix it yourself. Always call a professional in Bowling Green, KY, first. 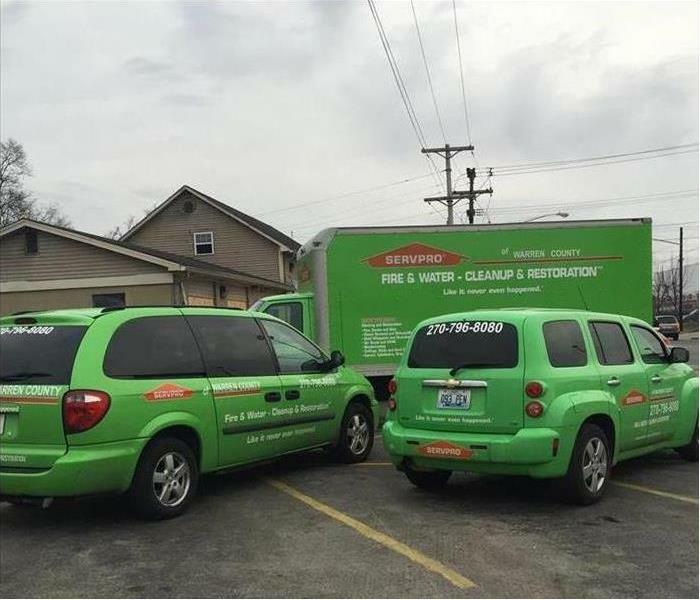 SERVPRO of Warren County is ready to respond immediately to water and storm damage emergencies. 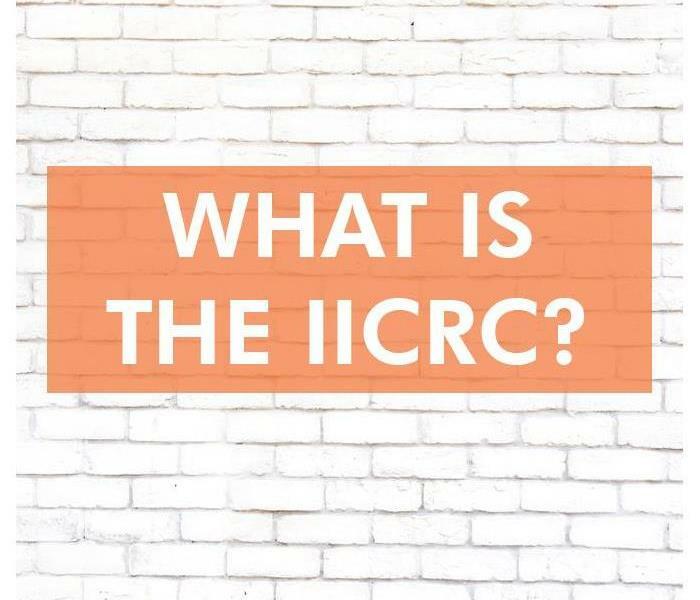 Why Is IICRC Certification Important? The standards for the restoration industry are set by the Institute of Inspection Cleaning and Restoration. A professional who holds this certification is prepared to use cutting-edge techniques and offer the highest standard of service. There are several reasons that the Preferred Vendors of insurance companies maintain IICRC credentials. ANSI and BSR standards apply to particular types of restoration, whereas Institute certification is earned by restoration professionals. In order to become certified, a service provider must demonstrate their knowledge of and ability to adhere to best practices for mitigation and restoration. The Institute regularly updates standards and offers new certifications. Even after a professional earns a certification, he or she must still obtain 14 credit hours of continuing education every four years. This requirement ensures that the certifications issued by this agency remain current based on industry standards. Any professional who holds a restoration or mitigation certificate should be capable of meeting or exceeding the expectations of clients and insurers. Most mitigation and restoration companies that insurance companies consider Preferred Vendors maintain certification. In order to be considered certified, a company or franchise must employ at least one credentialed technician. SERVPRO is an approved training school, and new franchise owners and employees are encouraged to obtain and maintain certification. Insurers can trust that certified restoration professionals will recommend the best methods for damage mitigation and restoration. Clients and insurers should make sure that the service they hire to restore damage is certified by the IICRC. This certification indicates that professionals are trained in the most effective methods. Inquire about the certification status of a damage mitigation and restoration company in Richardsville, KY.
A broken pipe or overflowing bathtub can cause leaks in the oddest places. 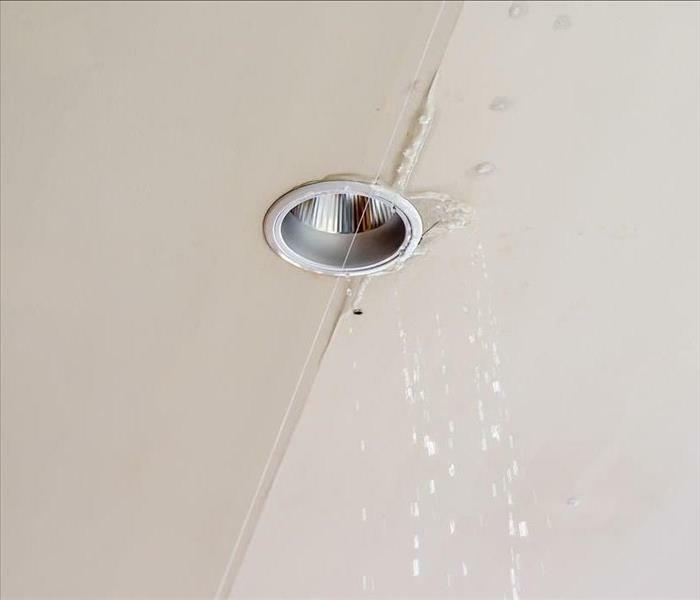 If there is a light fixture on the ceiling directly below the leak, you could find water in the light. Water and electricity don't mix well, so it's important to take a few preliminary steps before water restoration experts arrive to repair the water damage to your ceiling. The first thing to do is to stop the electrical current that is flowing to the light. Water is an excellent conductor of electricity, so a light fixture with water poses a risk of shock to anyone who comes into contact with it. If you want to make sure that the electricity is off, you can test nearby dry surfaces with a voltage tester that doesn't make actual contact with the surface. After you have eliminated the electrical risk, it's a good idea to shut off the source of the leak. If a toilet overflow is the culprit, turn the water off at the wall to stop water from running into the tank. If you have a broken pipe, you will likely need to turn the water off at the water main to keep from getting more water in the light below. Ceiling damage from a water leak is not the sort of thing you want to handle on your own. Certified technicians in Plano, KY, have the knowledge and tools to fix the problem safely and efficiently. By leaving it up to them, you can likely avoid secondary damage such as mold or further leaking and be confident that the damage is remediated completely. A leak on the second floor may result in water in the light below it. Your best course of action in this situation is to stop the flow of electricity and water to the area and let the professionals take it from there. Most people are automatically alarmed when they hear the phrase black mold. However, when dealing with other types of mold, they may be nonchalant about the removal process, foregoing safety measures and buying the most readily available cleaners. Then, they are surprised when the mold returns and keep coming back no matter how hard they scrub or which chemical cleaner they use. There is a good reason for this perpetual cycle, and that is that surface cleaning is only half the battle. Mold cleanup is thorough and deep. While you may only see the mold on the surface of your walls, it is likely deep within the wall cavity. Therefore, to truly eliminate a mold infestation, you have to get below the surface, exterminating the infestation where it began. Black mold, or any mold for that matter, spreads quickly, and its spores can allow it to hop from one location to the next, traveling on air currents and through vents. The ability for mold to travel means that it is necessary to remove all signs, and while it is unlikely to remove every spore in a home, eliminating the source of the infestation is a great place to start. As previously mentioned, mold spores travel on air currents, meaning that it is necessary to restrict that movement when trying to remediate an infestation. This control is difficult and time-consuming, as rooms must be quarantined from each other and ventilation limited and controlled. Also, movement in a room must be limited and slow. Mold remediation is best performed by a disaster restoration specialist in the Smiths, KY, area. These companies are certified and experienced in mold removal, and they will not work on your house until they test for species and understand the right path forward. While toxic black mold is dangerous, many mold varieties may produce adverse health effects. Therefore, before diving into DIY remediation, think about the chances of perpetual mold, and how a specialist may be your best choice. Space heaters can be very convenient, especially if you have one room in your home that never seems to get enough heat from your central HVAC system. Whether you use a space heater regularly or you only pull it out on the coldest winter days, here are four important steps you should always take to prevent fire damage in Bowling Green, KY, from a burned space heater. Before you use your space heater for the first time, make sure you clean all visible surfaces thoroughly. Dust and other small particles tend to build up on the heater’s surface and could potentially cause the unit to overheat or catch fire if not removed regularly. Never put your heater up against a blanket, piece of furniture or any other item. If you do, you’re likely to have a burned space heater before long. 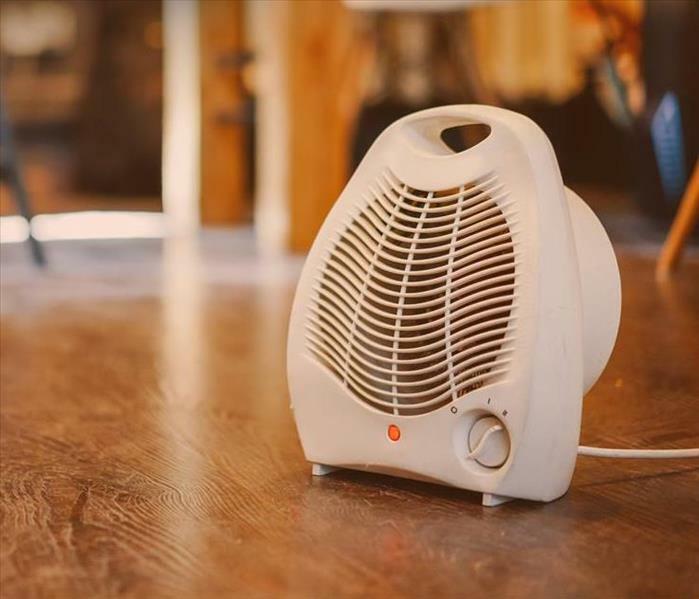 Space heaters should always have at least three feet of empty space around them, free from furniture, carpets and other items. Don’t operate a space heater in an area where kids frequently play. To reduce the risk of fire if a child does accidentally knock over the heater, make sure you purchase one that has an emergency shut-off mechanism. You should also keep pets away from heaters whenever possible. Never leave a space heater unattended. If you plan to leave the room for a few minutes or a few hours, turn the space heater off beforehand. You can easily turn it back on when you return. Following these preventatives steps will minimize your chances of fire damage while warming your home. If you experience a burned space heater or fire damage even after taking these preventative steps, a fire damage restoration professional can help with your smoke cleanup and restoration needs. The presence of mold leaves behind an unmistakable musty odor. 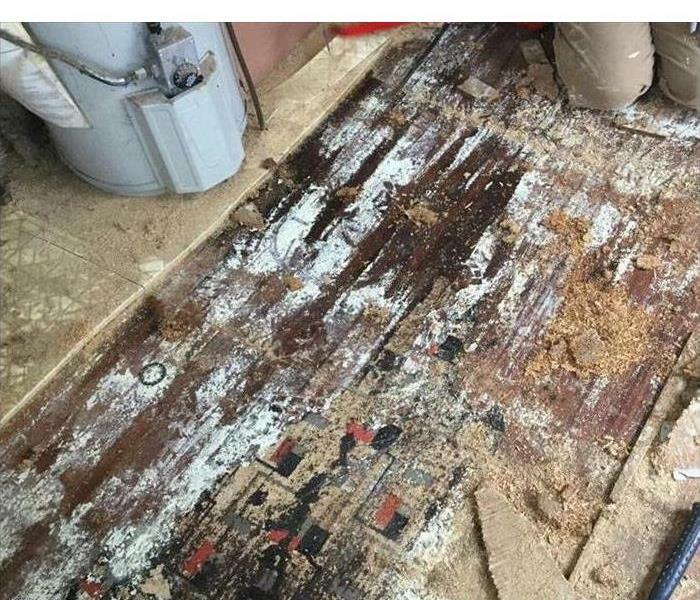 Although this fungus can develop inside a house when it is simply a little too humid, it is more likely to develop after flood water damages the premises. When that flooding is accompanied by sewage loss, the contaminants only exacerbate the problem. Homeowners in Bowling Green, KY should try to prevent mold growth entirely. However, if mold does develop, then you need to address it right away before a bad stench turns into something much worse. Mold is particularly destructive to certain materials, including gypsum board, plaster and wood. Over time, these materials may weaken and change color. You may not even see the damage if the item is painted, but the paint merely hides the mildew. The only way to ensure your home remains structurally sound is to remove all presence of mold. Certain structures may need to be replaced entirely to make sure your house is safe to live in. Mold growth can get out of hand in just 24 hours. It can spread exponentially when exposed to the right conditions. Leaks, condensation and high humidity can accelerate the growth process, causing the mold to overtake entire sections of walls and flooring. Over time, this can lead to toxic black mold. When bringing in a professional team in Bowling Green, KY to address mold in your home, it is vital that every sign of it is removed. This includes the mold you see on the wall as well as spores that have entered the air. Without addressing the problem comprehensively, the mold growth will simply resume, sometimes in less than a day. How Does a Restoration Company Respond to Large Losses? In the event of a hurricane, flooding, wildfires or other extensive damage in Smiths, KY, independent restoration businesses may find their resources pushed to the limit. This may result in longer response times and lower-quality service. In the event of catastrophic loss, homeowners should seek out a local franchise of a larger restoration company. Here three ways in which this model can improve speed and service quality. When it comes to storm damage, various regions are prone to different types of disasters. Damage mitigation and restoration professionals gain experience with the types of damage that occur most often in a region. A local franchise combines the benefit of regional expertise with the resources of a national company. In the event of a catastrophic loss, a local franchise may have a limited ability to meet homeowners' needs. A national network of more than 1,700 franchises enables SERVPRO to direct experts and specialized equipment to areas in need. This makes it possible for a local franchise to exceed the service volume of independent mitigation and restoration companies while maintaining quality. A national company with industry-standard certifications is a Preferred Vendor of many insurers because of its ability to stand by its work. The structure of this business can enable a franchise in an area experiencing a crisis to call on additional resources to meet local needs. This can ensure that every homeowner receives as fast a response time as possible along with complete, high-quality service. A company with the ability to call on more than one thousand franchises is better able to respond to a catastrophic loss scenario than an independent mitigation or restoration service. When independent businesses are slow to respond, homeowners should rely on the leading mitigation and restoration company with a franchise located in Smiths, KY.
3/24/2019 - Why Is IICRC Certification Important? 2/18/2019 - How Does a Restoration Company Respond to Large Losses?